Any time I write a blog post to link up with Ruth on Saturdays, Kool & The Gang’s Celebration is always going through my head as I begin. I don’t think that song has ever been more appropriate than this weekend. If you had told me just one month ago I would be sitting here in my home today, typing a blog post in my pajamas, I would have been confused. ALA’s Midwinter Conference was on my calendar and I was hopping on a train Friday morning, returning Sunday. Nothing would keep me from Chicago and book discussions galore. I couldn’t wait. Enter Rose. Two weeks ago a friend and colleague contacted me. She was looking for a new home for her one year old Cavalier King Charles Spaniel. She felt she wasn’t home enough and knew that with our two boys, Rose would get plenty of attention. Were we ready? Ha! I knew I was, I knew the boys were, but Chris? I wasn’t sure. Bally had been his first dog. He really wasn’t sure if he wanted another. And yet, he said yes. Rose came home and I knew I needed to stay home this weekend. Beyond wanting her to be comfortable, we were saving money for a summer trip. With getting a new pup, something had to give. Yes, I realize there is a big football game this weekend, but my eyes are turned towards Monday. I think every year I am more and more excited for American Library Association’s Youth Media Awards. I love predicting the Caldecott and Newbery winners with my students. Learning more about each award as it comes up. Finding titles I love honored, finding titles I haven’t read and must read immediately. It is so much fun. This year a snowstorm is looming, with it the threat of a little snow or a lot. At first, I was bummed. What if it dumps a lot of snow? What if we have a snow day? Then my students and I cannot watch together. Yep, a snow day would be ok too. This weekend simply fills my heart with joy. I love the celebration around books, authors, illustrators, publishers, and children’s literature. I love that an industry that has given so much to my students – and to me – gets its time in the limelight. And while I have plenty of favorites that I’d love to see get a shiny sticker on the covers of their books, I am thrilled to celebrate any books that win. No, I might not be in Chicago hugging friends, talking to authors and publishers, picking up some advanced copies, but I am right where I should be. And I think I will celebrate the best way possible, by picking up a book. Several months ago my friend, Colby Sharp, began raving about a book he was reading. Finding Serendipity was that book. I looked it up online and immediately was impatient to read it. When the ARC arrived at my house, I excused myself for the day and curled up with the novel. While my students know I often struggle to begin a book, taking some time to fall in love with new characters, I didn’t have that issue with Finding Serendipity. I immediately grew to love Tuesday McGillycuddy and her amazing dog, Baxterr. (Yes, there is a double r on purpose.) Tuesday is the kind of character I love. She seems real. She’s kind, curious, and brave. She feels like she could reside in my classroom just as easily as she does between the pages of this novel. More than anything, I love the fact that I have at least fifteen students that I know will love Tuesday just as much as I do. She is a character they will cherish. In this book, Tuesday’s mom is the amazingly talented – and famous – author, Serendipity Smith. Serendipity has written a hugely popular novel series that follows the story of a girl named Vivienne Small. In Finding Serendipity, Tuesday’s mom, Serendipity, has disappeared. Tuesday and Baxterr have to go on an quest to find her and bring her home. Along the way, Tuesday discovers hidden secrets that have been in front of her all along and, also, she discovers talents she didn’t know she had. While absolutely a fantasy story, parts of Finding Serendipity felt so real to me. It would be a great bridge book for my students who love realistic fiction, but want to being to venture into the waters of fantasy stories. At the end, I was beyond sad to leave this world that author Angelica Banks has created. Angelica Banks is a pen name for two friends, Heather Rose and Danielle Wood, who decided to try writing this book together. 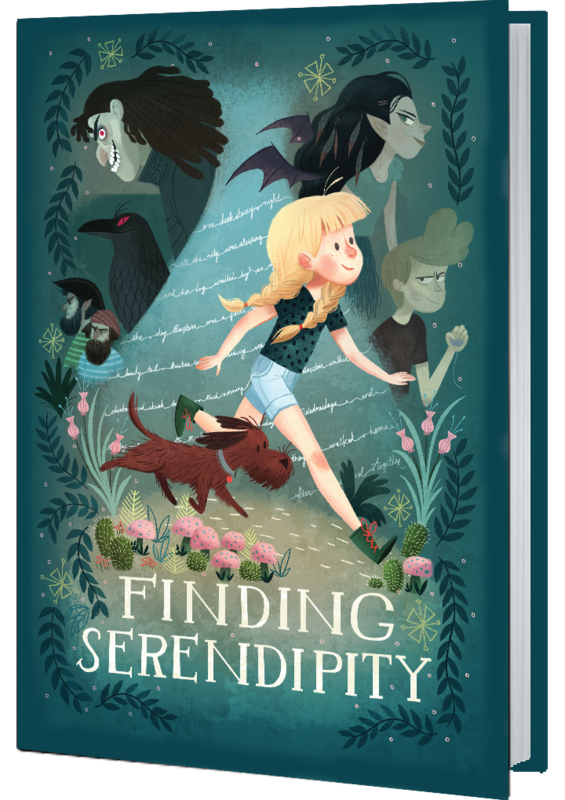 I’m thrilled to see that Finding Serendipity is just the first book in a planned series. I cannot wait to see what Tuesday and Baxterr are up to next. I had a teacher contact me the other day in shame. She said she read my blog and wished she could always say the right thing with her students. That I was fitting so much in my day, when she couldn’t manage to do so in hers. I hated to laugh outright at my computer, but I kind-of did. I don’t mean to ever paint this blog in a way that I am perfect, because I’m not. I don’t mean to ever say that I have it all figured out, because that is certainly not true. I’m still learning, still trying, still messing up. Before I went over to talk. Questioning what I had done. Or preparing them for success. Who hasn’t read for three years. Spark Notes are his friend. Was reminded of why I love teaching. Because we are all fallible. We can begin anew each day. 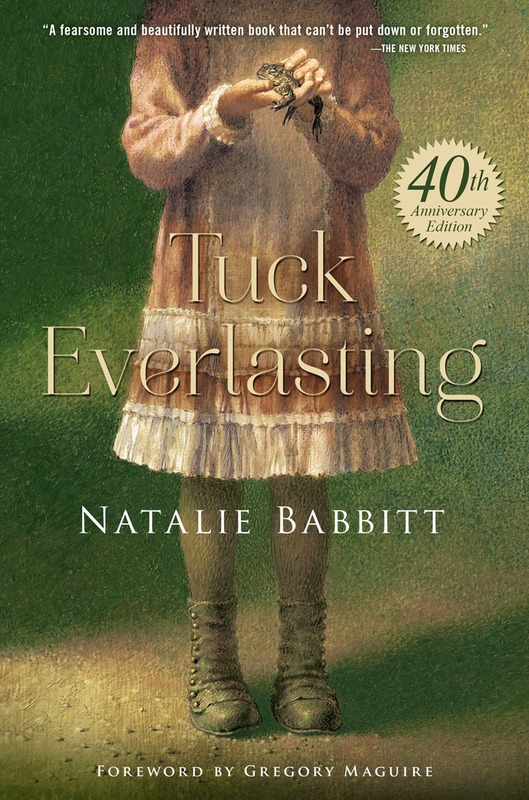 Tuck Everlasting and I have something pretty special in common, we’re both forty years old. Now while I can only hold on to that number for a few more weeks, Tuck is just beginning the celebration. When I look at this book, I am beyond frustrated that I waited so long to read it. Obviously, I could have picked it up when I was growing up. However, I was more likely to be dreaming of life on the prairie with Laura or of wandering around Prince Edward Island with Anne. Fantasy books were not for me, or so I thought. Imagine my surprise when I became a teacher and began to dip my toe into the world of fantasy. I was mesmerized. As a new teacher, I devoured fantasy books. One day I found this gem of a book and knew what I had been missing for all of these years. I couldn’t wait to share it with everyone I knew. If you, like me, have put off reading this book, remedy that immediately. Here you stumble across the typical fifth grader’s ultimate wish, to live forever. It would be the best thing ever, right? Winnie Foster gets to uncover that answer when she meets the Tuck Family. For them, eternal life is their reality. This book delves into the question on whether living forever would really be something you should wish for. I was fascinated with the entire concept. And, like others on this blog tour to celebrate Tuck’s 40th, I needed to answer the question, would I live forever if I could? I knew my answer immediately… absolutely not. Many people know that I struggle with anxiety. A trigger for me is illnesses and even the thought of death. In fact, much of my anxiety began when a loved family member was in the hospital in ICU. Knowing that, one would think I would choose to live forever. That would be the dream, would it not? A lot has happened since that time several years ago. I’ve lost many beloved family members and some friends. I’ve watched students lose parents and parents lose children. Death is a horrible part of life, but it is a part of our life. To know you would never die? How would that change everything? As the years have passed and I have reflected, I’ve realized that I don’t fear death quite as much as I used to. What I do fear is an unlived life. 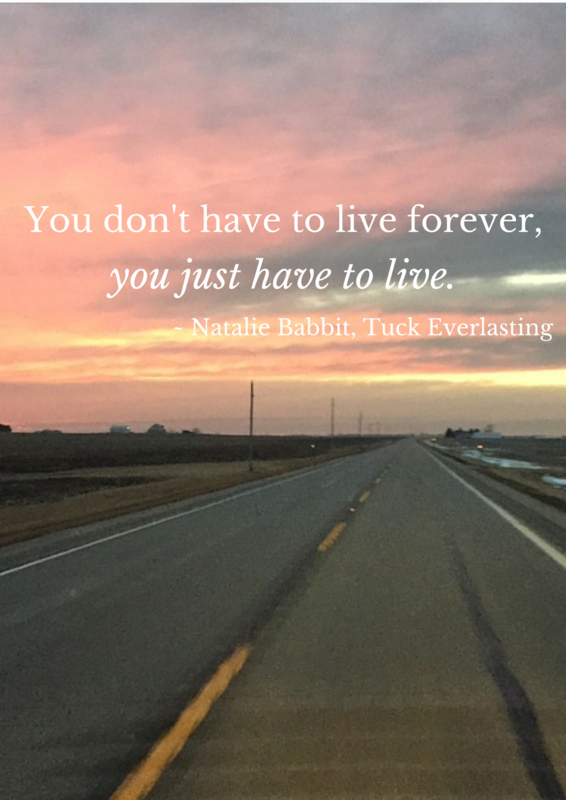 Natalie Babbit wrote in Tuck Everlasting, “Don't be afraid of death; be afraid of an unlived life. You don't have to live forever, you just have to live.” And that is just what I have tried to do, live. I try not to let anxiety hold me back. I try and be as kind as I can, give as much as I can, and treasure the time I have here. I try and find beauty in the everyday and pleasure in the things around me – like sunrises and sunsets, the laughter of a child, the quiet sigh of happiness of my dog. And I try my hardest to pass that attitude on to my children and my students. It is through them that I gain life after I am gone, a legacy. I hope you will join me—and others—in celebrating this magical book. Join the conversation on Twitter using the hashtag #Tuck40th. Order the amazing anniversary edition with a forward by Gregory Maguire (wow!) HERE. And live your life to the fullest. I have a student teacher this semester and while I am always reflective, I find that having a student teacher makes me even more so. I begin to notice what I do and, conversely, pause to consider why I do that. I think when you’ve taught for as long as I do, things do become rote. I know what works, I know what doesn’t. Even with the new CCSS looming over us, I know where fifth graders need to be, what they need to learn. So much of what I do is automatic, but there is a lot of intention behind every action. It is in the act of teaching someone else to do this that I realize how much thought goes into it. And in explaining what I do, I tend to get a bit emotional. I gave him a half hug and asked the kids to line up for lunch. I remember looking at my student teacher and wondering what she thought about the interaction. I definitely could have done more, but there was no real need. Our relationship at this point of the year is pretty strong, and I don’t feel the need to talk a lot when fewer words will do. But, in looking at my student teacher, I knew I needed to point something out. I asked her if she noticed that I told my students I love them. She smiled and said she heard it a lot. And then I shared my story. And that cemented it. From that moment on I made sure every single kid knew I cared about them from the moment they stepped into our classroom. The ones that were quiet, the ones that were easy, and – most especially – the ones that were tough. They all need to hear it, because we cannot count on it happening at home. Student teachers have to absorb so much in our time together. I told mine that her first priority, before we even begin to talk about curriculum, is to build relationships with every single child in our classroom. She is off to an amazing start. Leigh Anne Eck writes about making sure students know they matter. Momastery writes about a teacher in her child’s life.